Lisa Peterson, Associate Director of Berkeley Rep, and director of “Watch On The Rhine” at Berkeley Rep, in conversation with Richard Wolinsky. “Watch on the Rhine” by Lillian Hellman was first presented before the U.S. entered World War II, when few people in this country understood the dangers of the rise of fascism in Europe. Today, it’s still a relevant anti-fascist play. During World War II, it became a film starring Bette Davis and Paul Lukas (who won the Best Actor Oscar that year) and is available via streaming. 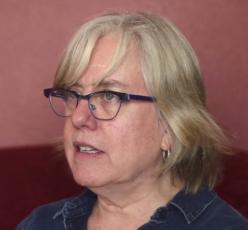 In this interview, Lisa Peterson talks about this new stage production of “Watch on the Rhine,” as well as her upcoming directorial project, “Office Hour” by Julia Cho, and her history as a director.